Just a short drive south of the medieval city of Kilkenny, Mount Juliet awaits. With lavish accommodation options tucked away in the heart of one of Ireland’s most beautiful country estates, as well as Jack Nicklaus' only signature golf course in Ireland, Mount Juliet is without doubt one of the finest golf travel destinations in the country. The Golden Bear’s course is so good in fact, that it hosted the American Express World Golf Championship in both 2002 and 2004. With fantastic leisure options on-site and the popular city of Waterford just a short drive away, Mount Juliet is perfectly placed to offer golfers and non golfers alike the perfect Irish country retreat. Based on Classic Double room, upgrade to Executive Twin for £15 per person (sharing) per night! Set within the outstanding scenery of the Mount Juliet estate, the Jack Nicklaus designed golf course measures a monstrous 7,300 yards at its full length so; needless to say it can pose a big test of even the most talented player’s game. 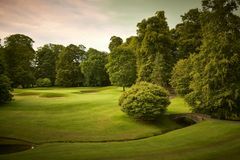 Characterised by undulating fairways, expansive water hazards, numerous bunkers and vast putting surfaces, Mount Juliet has a distinct American feel to it but when surrounded by such stunning countryside that is so quintessentially Irish, that is no bad thing. The course was opened in 1991 by Nicklaus himself and the opening was marked with an exhibition match between the Golden Bear and Christy O’Connor Senior. The course is considered by many to be the best inland layout in the country with visitors being struck by an endless procession of exciting and memorable golf holes. Among the best is the 3rd hole, a glorious par-3 played downhill from an elevated tee to a green protected by a natural stream and a lake. To finish, golfers will have to negotiate a demanding par-4, which is threatened all along the left side by a massive water hazard. As you would expect from a golf course that has hosted the world's 50 best golfers, the course is a bit of a monster from the tips but thanks to a number of well thought out tee locations on each hole, the handicap golfer can easily play it from a length that best suits their game. Mount Juliet also boasts top-of-the-range practice facilities, including a 350-yard long two-tiered driving range and a three-hole Academy Course. The practice putting green is a particular highlight. An 18 hole, par 53 putting course complete with bunkers and water hazards should be enough to get your putting stroke in check before you take to the course! The Earl of Carrick built the extraordinary house 200 years ago, and it retains all the character that it exhibited in its original days. There are 32 bedrooms, including two Presidential Suites, all of which are individually designed and boast period features and furnishings. Each room is individually named, according to the most recognisable focal points of the estate itself, which ensures that all visitors have a personal experience. As far as possible, the original features of the country house have been retained or restored, and this attention to detail has seen Mount Juliet being awarded Hotel Of The Year by the AA. Our internationally-themed menu consists of dishes made using local ingredients, including many from our own kitchen garden, herb garden and farm and is overseen by head chef John Kelly. Situated within touching distance of the golf course, the brand new 93 bedroomed Hunters Yard Hotel is perfect for those looking to enjoy the welcoming atmosphere of the Clubhouse and all of its surroundings. The Clubhouse bar, the 140 seater Hound Restaurant and the delightfully elegant Saddle bar are right on your doorstep when you stay here and the spa facilities and leisure centre are just a stone’s throw away, making the Hunters Yard hotel arguably the most convenient of the Mount Juliet accommodation options. The Hound in Hunter's Yard is a warm, inviting, ‘one-size-fits-all’ place to eat. It’s welcoming, it’s informal, it’s child friendly and it’s good value – above all, it has commanding views of the Jack Nicklaus Golf Course that will take your breath away. The Saddle Bar at Hunter’s yard is synonymous with the Estate’s equestrian history. It’s the ideal spot to relax after a long day or to drop in for a drink before dining in The Hound. By choosing Mount Juliet for a golf break, visitors will guarantee being treated like royalty for the duration of their stay. The facilities are unrivalled, and the setting is truly magnificent. The Spa at Mount Juliet utilises the exclusive E-SPA range of products to complement the range of health and beauty therapy. The Spa is ably backed up by the leisure club, which features a 15-metre swimming pool, sauna, steam room and gymnasium. A speciality in the Spa facility is the Dead Sea Discovery Flotation Room. Mount Juliet Equestrian is one of the most advanced in the country, with two all-weather arenas, a full set of FEI approved show jumps and a 30 acre cross country course, in addition to trails spread across the 500 acre estate. Mount Juliet House offers private fishing on 2.5 miles of the middle to lower reaches of the River Nore. Mount Juliet Estate offers fishing of the highest quality, just a short stroll away from the Manor House. There are few places as beautiful and as evocative as Mount Juliet for practicing the ancient art of archery, though of course, our equipment and training are of the highest modern standards. There is some question as to whether the term ‘Sport of Kings’ refers to Falconry or to Horse riding. The good news is, we offer both at Mount Juliet. Your falconry experience takes the form of a walk through the estate, with our expert falconers from Hawkeye Falconry. Most beautiful hotel with fabulous facilities and great staff, slight bugbear was clubhouse stopped serving at 6pm requiring golfers to eat a la Carte at the considerably more expensive restaurant, other than that perfect. Beautiful course and a great test of golf.